Plan a Romantic Valentine’s Day Getaway. Book a Mountain Hideaway Today! Planning the perfect date on Valentine’s Day can be really tricky between finding the perfect place, securing reservations, and fighting through a crowd of couples. Why not save yourself the trouble of planning the perfect date out and have a romantic evening in one of our Gatlinburg honeymoon cabins? Staying in a cabin is much more affordable than you might think, and it guarantees you an evening with no delays or interruptions. If you have been married for years or have yet to pop the question, you may not be looking for Gatlinburg honeymoon cabins, but these lovely spots make for the perfect base for a Valentine’s Day excursion. All of our cabins come with full kitchens—just what you need for showing off your culinary skills with that perfect meal. Honeymoon cabins in Gatlinburg have more than just modern amenities, however. Your romantic getaway could feature breathtaking views of the Smoky Mountains from a hot tub on your private deck or an evening illuminated by the flickering flames from your fireplace. One of our favorite cabins for a Valentine’s Day getaway is Mountain Hideaway. Pick your favorite porch to enjoy the peaceful forest setting in this gorgeous cabin where you will feel miles away from everyday life. The upper deck has a hot tub and, just inside, the living room has two comfy couches in front of the large fireplace, set in stacked stone. Warm your hands on the wide hearth before heading to your king bedroom for the night. This 1BR/1.5BA cabin also features a pool table. Here are some additional Gatlinburg cabin ideas for Valentine’s romance! Consider Great Escape, for example, which has one of the most memorable jacuzzi spots in the Smoky Mountains. This 1 BR/2BA chalet has a striking jacuzzi room that juts out over the large deck, allowing you views of the Smokies on both sides and even looking up, all while cuddled up together in the whirlpool. Once you have soaked your stresses away, turn on the two-sided fireplace and snuggle up in the living room or in your king bed. You can also create an alpine fantasy in beautiful A-frame chalets like Owl’s Nest, perched on a mountainside. 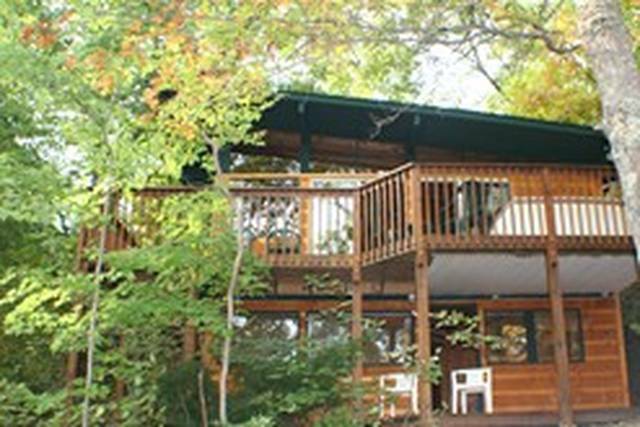 The large back porch has a picnic table and hot tub, while a wood-burning fireplace is surrounded by comfy sofas inside. You might even spot some of the Smokies’ famous wildlife nearby, but you can also bring your dog to this pet-friendly cabin. Canterbury Cottage is situated in a lovely wooded area with a back porch hidden behind it. With a hot tub, jacuzzi, and beautiful stacked-stone fireplace, you will have no problem finding places to curl up with your sweetheart. There is even a games room with pool table, air hockey, and ping pong, should you wish to get your competitive juices going! Plan a Valentine’s Day to remember in one of our honeymoon cabins in Gatlinburg!